crafting with katie: MCT Original Gourmet Lollipop Collaboration! MCT Original Gourmet Lollipop Collaboration! Good morning and welcome to our collaboration with the FABULOUS "Original Gourmet Lollipop" company! We are ALL super excited to partner up with this company because they truly do have the BEST lollipops around! Many of you are familiar with our famous Stitched Lollipop Holder Die, which fits the famous OG lollipops PERFECTLY! Well, we just discovered the "mini" OG lollipops! We LOVED them so much that Emma designed a brand new Mini Stitched Lollipop Die. This new die fits the mini OG lollipops to PERFECTION! Join us as we showcase BOTH sizes of these dies so you can see the difference! I had so much fun using the Stitched Lollipop Holder Die and the Mini Stitched Lollipop Die to make Halloween treats! I used patterned papers from the My Mind's Eye Wicked collection for the small treat and Papertrey Ink's Halloween Treats for the larger treat. On the larger one, I also used the Scallop & Stitched Circle Dies, stamping "EEK!" from Happy Haunting in the center. I then added a few bats made with the Wicked Fun Dies and I created a little strip at the bottom with a border stamp from Spooky Time. For the smaller treat, I used the little scallop die that comes with it, but added a circle made with one of the dies from You Are Spot On. The sentiment there came from Too Cute to Spook, as did the little spider stamp and die! Here's a look at the side, showcasing the yummy OG lollipops. FYI, the Pumpkin Latte flavor is DELICIOUS!!! And here's a look at the Stitched Mini Lollipop Die. Leave your comments on all of our blogs for an opportunity to win one of Emma's original Stitched Lollipop Holder Dies along with some YUMMY lollipops from the Original Gourmet Lollipop Company! Use the code: OGPOP to get a discount off your entire order! Whoever orders the new Stitched Mini Lollipop Die will get a FREE "Mini Original Gourmet Lollipop" with your order! This special is for 48 hours only! This special will end on Friday, September 30, 2016, at midnight PST! OMG Miss Katie...Both of your Lollipop Treat Holders turned out Wicked Awesome. Love your clever and creative stamping ideas...you definitely shared a multitude of creative ways to use Miss Emma's goodies. You definitely did 2 Outstanding Spooktacular jobs. YOU so ROCK!! Love your treats! Great designs as well as colors. I really like how you used the "banner" (stamp) on the larger lollipop. EEK ... your treats are too cute ;). Loving the new mini lollipop die! Eek, these are so cute! 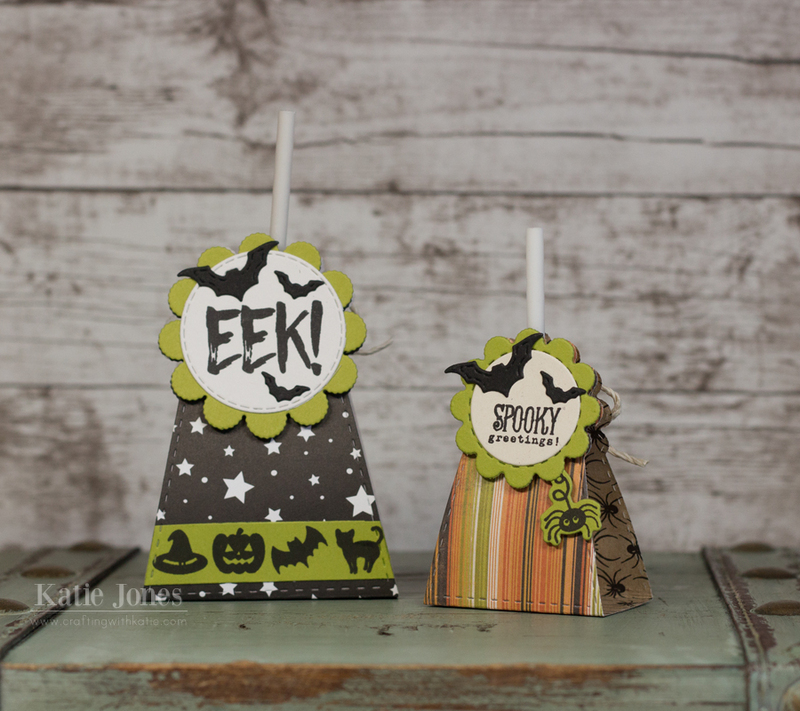 Eeek--how cute and spooky and great way to give a Halloween lollipop. Oh my, Ms. Katie! So So cute. Your treats are super cute! I absolutely love those papers too!!!! I just love these! They have a vintage look too me and I just love vintage!! Great job! love ur strioes and greens, great job!!! I love how these are decorated and the paper you used! Love your ideas. the little spider is so cute. Simply adorable! Love your sucker holders with the fun Halloween stamps! Super cute lollipop holders big and small! Wonderful job on your spooky treats...love the colors and the bats. Eek! They really look spooky. WOW! What a sweet treat ensemble you've designed for us, showcasing the original lollipop holder and it's 'mini me' version that is just incredibly adorable! Your images: cute AND stylish! *EEK-cellent* in every way! These dies are calling my name; perfect for making treats for my niece's Gr. 1 class (60 total in the combined classes), my nephew's daycare pals (25) and, of course, their teachers and educational assistants. Thank you for the smiles and inspiration today! These lollipop holder treats are so cute. They are great for teacher gifts, CCD class, co-workers....and I could go on and on. Great Job. Thanks for the ideas. These are adorable! 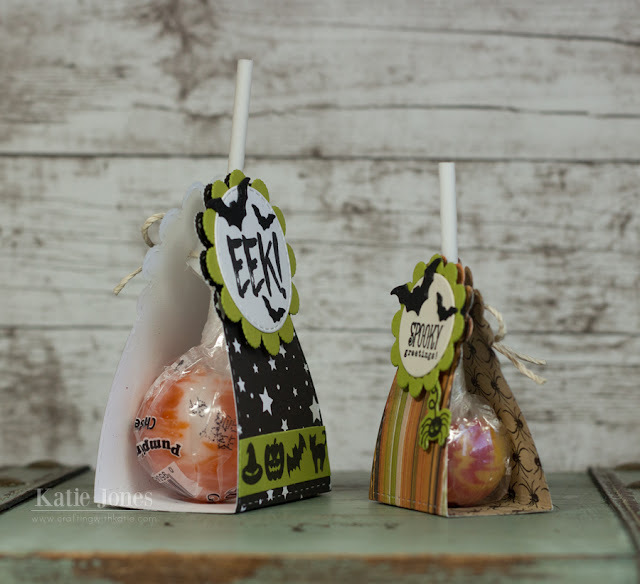 Fun papers and details to decorate these lollipop holders! I adore the new mini size die! So fun! MCT 59th Edition Release Blog Hop!